Peltier is the Fantastic device used to make cooling devices. When a current of more than 500 mA passes through the Peltier, its one side cools while the other side turns hot. This is due to the transfer of heat from one side of the Peltier semiconductor to the other. As the current increases above 1 Amps , the cooling effect increases and the temperature of the cold side of Peltier drops below 0 degree. But if we reverse the function of Peltier, it generates electricity. For example, if we heat one side of Peltier above 60 degree using a hot object, hot water or flame, Peltier generates around 1.6V DC and around 350mA current. Let us make one circuit of “Free energy “generation using a Peltier Module. Since the 1.5V from the Peltier is not sufficient for lighting an LED, we have to add a voltage booster to increase the Peltier voltage sufficient to light the LED. If 5 Peltier are serially connected, we can even charge our Mobile phone using a Candle flame. It is not a wonder but a real fact that, we can light a 3 V 1 Watt LED without any battery power. You can harvest that much “Free Energy” from a Computer cooling Fan that is resting in the Junk box. A Computer Fan generates around 1.5 Volts with a current of around 80 mA during its full speed rotation when coming close to a Table Fan. By adding a Joule Thief circuit, we can boost this 1.5V to around 4 volts. Well, that is a good idea. When the Computer Fan is close to a Table fan, the forcing wind from the Table Fan starts to rotate the Computer fan in its full speed. The 1.5V thus generating from the Computer fan appears in its connecting wires. Joule Thief takes this voltage and boosts it to 4V. It is sufficient to light a 3 V 1 Watt LED. 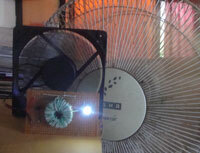 The Computer Fan used in the project is an original one without any manipulation and not like the one found in some videos with a hidden battery. Let us see the “Free Energy Magic”. You can also name it as “Wind Power Project”.